Next time you’re walking in downtown Santa Rosa, take an eyeful of the “Empire Building,” and notice that something’s wrong. The building itself is quite 20th century – but the clock tower harks back to America in the years after the Civil War. What were they thinking? Slapping an old-fashioned clock tower on an elegant new building does not fine architecture make. Howard’s drawings of his original design appeared in both local papers in 1908 (the copy at right was taken from the May 16 Santa Rosa Republican – click to enlarge). 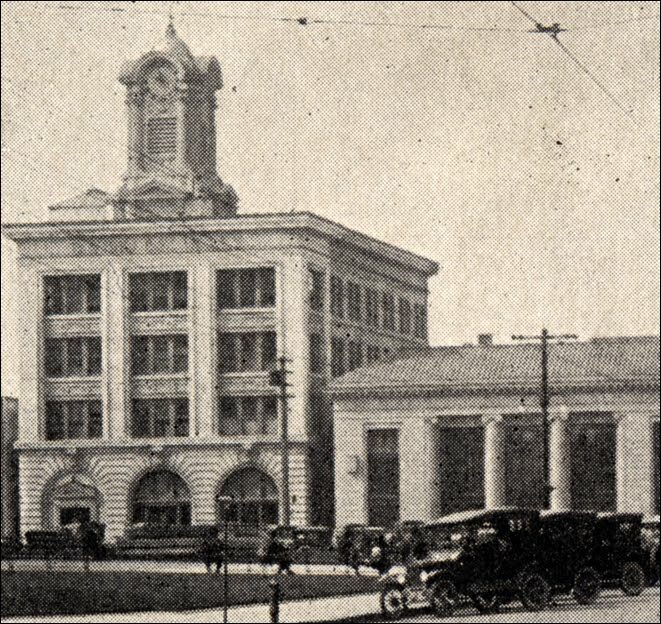 It shows a building very much in his Beaux Arts style; it would have looked quite at home at the university, and in fact, his exterior for the Santa Rosa Bank resembles an office building version of the Hearst Mining Building, which he had completed the previous year. On the ground floor is rusticated masonry with ornamented keystones above each arch. The roof line has a wide overhanging eave that sits on the top like a crown. The primary difference with what they built was that the overhang was scaled back considerably and simplified. And, of course, a clock tower was added. To anyone schooled in architecture at that time, the clock tower must have been jarring. John Galen Howard’s building was classically-inspired modern architecture, with strong clean lines; the clock tower was in the too-busy Second Empire style from about forty years earlier. Almost identical clock towers can still be found on courthouses and government buildings built 1870s-1880s, particularly in the South and Midwest; the one here in Santa Rosa might well have been ordered from a factory that prebuilt the things. And, of course, Santa Rosa even added the garish touch of a gilded dome with a weather vane on the peak. All in all, it was a bit like the Beverly Hillbillies plopping a double-wide on the roof of their nice mansion to house Jethro’s less sophisticated kin. But why the clock tower at all? In “Santa Rosa’s Architectural Heritage,” Geraldine and Dan Peterson write that “…community sentiment toward the clock tower of the earlier building on the site was strong enough that the roof line was redesigned…” If there was any discussion of this in the papers, I’ve overlooked it – but it’s certain that the earlier building did not have a clock tower. The image below is an enlargement of a section from a postcard showing pre-earthquake Santa Rosa, and the old place clearly had neither a tower nor clock. Today no one notices that the building and clock tower clash in style and scale; all focus is on the quaint old tower, and John Galen Howard’s building has become simply its base. There are dozens of photographs found on the Internet but none are of the building itself with the tower cropped out; however there are many closeups of the tower alone. And whoever thought of painting the dome gold was inspired – nothing shouts “what a classy place!” like bling. The progress of construction of the new bank building has been watched with interest during the months that work has been under way. It is a “Class A” steel structure, and at once appears to everybody on account of its solidity and massiveness. And now that the finishings have been installed, the effect is most pleasing. The bank’s quarters in the new building are ideal for the transaction of business–care having been taken that this should be so. It is admirably lighted and the tiled floor, the fixtures and all other points are in pleasing accord. The work of moving into the new building was begun last night so that everything could be in readiness for the commencement of business on Monday morning. In the right hand corner of the main building is the president’s office, attractively arranged and furnished for the purpose to which it will be put. Next in line is the receiving teller’s window, then the paying teller’s window. The cashier’s office and then the bookkeeper’s department are all provided. All these departments are thoroughly equipped with everything necessary.. There is a handsome frontage of heavy plate glass. The directors have a nice room. Taken severally and as a whole the furnishings could not have been selected with more taste in order that they should be in keeping with the general appearance of a very fine modern bank building.